Today in the morning we picked up the last imprisoned german people, who were released. All of them have to leave the country in about two days, there are still around 6 people in prison as one of them report. One person from UK, one from Ukraine and Belarussian and Russian people. Someone from the "not western" prisoners reported one of the belarussian was beaten once in the police bus directly after arresting situation. In another bus someone opened the window and was screaming outside "No to police state". He was graped in the hair and pulled back. In the "western" bus some OMON tried to beat with his stick some person but failed and hit another one on the shoulder. At the police station someone gave false name and said he is british, because the door was open he managed to escape. The police was confused what to do with the foreigners at all, the head of police station said "why did you arrested foreigners, now we have problems"
it seemed all in all, that OMON special police and ordinary police did not like each other so much, they were not communicating so much. One person was alone in another room and one police man tried to force him to say something about the case by grapping his t-shirt and pulling him. When this prisoner wanted to sit down on a chair, policeman took it away, hoping that he would fall down. Actually he did not. 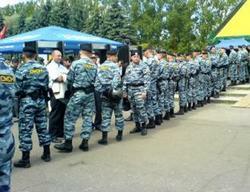 The people from ex-soviet countries were in another prison after all were together in one police station. Some people denied to eat, one person did not eat at all from sunday till tuesday for protest reasons. The person who had to go to hospital sunday evening after court was sick all the day befor, it is not clear if he was beaten on the head but he was participant of the antiwar picket, not the blockade. On sunday there was no visit allowed at the Ex-soviet fraction of prisoners but monday someone let to bring food inside. They had bed sheets to cover, the western not. The prison was very small and dark, there was no chance to read for example. one person was said in russian "if you want action go to chechenya" One person from germany who wanted to bring food was said by responsible police officer "if you want we have also a place for you in prison" the access was denied.